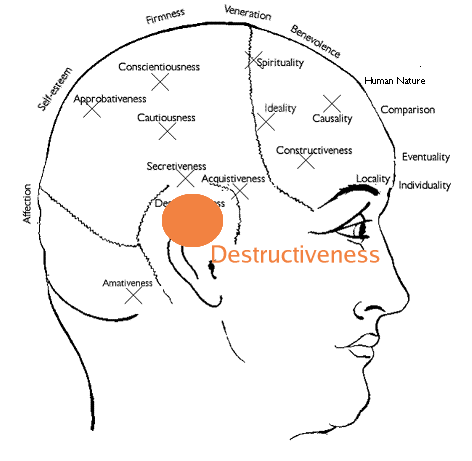 Destructiveness is the area of dynamic energy. Some authors call it "Executive Energy". It stands for force, dynamism, fighting spirit (for any cause). It accumulates energy, basically for self-preservation. If untempered by the Moral faculties, which may direct its innate energy to higher aims, it will express itself in anger, violence, cruelty, vengeance. Destructiveness is located above the ears; if this faculty is strongly developed, the area above the ears will appear convex. Destructiveness + strong Intellectual faculties: intensive thinking activity.